The global cryptocurrency market started 2018 with a bang, hitting a record high of $700 billion in market capitalization. All signs point toward an increasingly large cryptocurrency exchange market as new crypto traders continue to join exchanges. In light of this, let’s take a look at the mechanisms of cryptocurrency exchange. 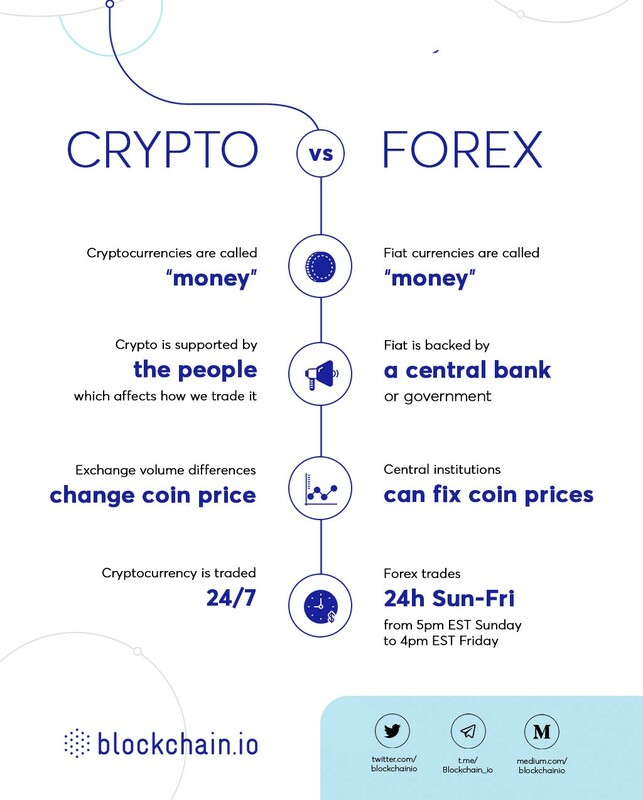 In doing so, I’ll touch on the basic differences between the foreign exchange market (forex) and cryptocurrency exchanges, so newcomers to crypto trading can know what to expect. Fiat and crypto currency are both considered money. Both can be used to purchase goods and services and transfer value, both are considered only as good as the respective systems that back them, and, of course, both can be traded on exchanges. What are some main differences? Although cryptocurrencies are used the same way as fiat currency, they lack status as legal tender in many nations. This, however, has neither deterred several major international companies from accepting cryptocurrencies as money to purchase their products, nor has it affected the steady growth of crypto trading. Of course, not being a legal tender means not being backed by a central bank or government, which in turn affects how we understand the value and use of these two forms of money. A fiat currency’s value derives from a number of parts to a nation’s economic apparatus, including monetary and fiscal policy, workforce, goods and services, gold reserves, debt to GDP ratio…the list goes on. Concerning use, transactions made with fiat currencies, especially digital fiat transactions, grant central authorities access to an individual’s spending habits, whereas cryptocurrencies, being true to their name, grant anonymity to users. So, if the value and transference thereof are different between these two forms of money, it would follow from this that the way in which we trade these currencies would be different. For example, a central authority can by fiat — no pun intended — dictate the value of its currency. This is not possible with cryptocurrency. Their respective values are distributive in nature. For this reason, a crypto coin can trade at one price on one exchange and at a different price on another. This is due mainly to a lack of consensus on a coin’s trade volume, which can be larger or smaller depending on the exchange. Because the amount of coins traded on each exchange is only a part of the total number of coins in circulation, a consensus on the price of each currency is harder to gain — particularly without the involvement of a central authority. To avoid the effects of varying prices, crypto traders tend to stick with one exchange market as opposed to trading assets across several exchanges through arbitrage, which is done with forex. How do crypto exchanges function? Depending on the exchange, traders have the option to trade fiat to crypto, or crypto to crypto. When trading cryptocurrencies against each other, the top cryptocurrencies show a lack of correlation, meaning a coin can gain or lose value independent of others. This is another reason why crypto traders trade currencies on the same exchange, granting the benefits of each coin’s volatility (variation in price over time) by allowing traders to trade according to the likelihood of a coin’s independent gains on the platform. Looking a little deeper into cryptocurrency volatility, bitcoin tends to have the least amount of volatility among crypto currencies, and can at times be used to gauge the overall rise and fall of cryptocurrency prices due to its longstanding as a cryptocurrency and its dominance in market capitalization. With differences in price, volume and correlation, newcomers to crypto trade should above all practice patience, which can admittedly be challenging given that cryptocurrency is exchanged 24/7 while forex only trades 24 hours a day between 5 p.m. EST on Sunday to 4 p.m. EST on Friday. If you’re unfamiliar with forex, you’ll have some things to learn, and if you’re familiar with forex, you might have to unlearn some things. The key is to approach the cryptocurrency exchange market understanding that while it bears many of the same traits of forex, it is a currency exchange in its own right. Visit blockchain.io for more information and join our whitelist to become a part of the cryptocurrency exchange of trust on the Internet of Value! Full time Bitcoin entrepreneur since 2011, coder, Internet of Value evangelist.